Chelsea vs. Napoli : 14 March 2012. This was an evening which reconfirmed everything that I love about football. This was an evening in which the busy streets around Stamford Bridge were invaded by thousands of fevered Neapolitans. It was an evening of almost terrifying drama. It was an evening of raw emotion. It was an evening of boozy camaraderie. And it was an evening when the players, and supporters, of Chelsea once again worked together to provide the watching public a devastating game of football. Make no mistake. The evening of Wednesday 14th March 2012 will go down in our history as one of the magical nights of European football at Stamford Bridge, alongside the “come-back” nights against Bruges in 1971, Bruges in 1995, Vicenza in 1998 and Barcelona in 2005, to say nothing of the ridiculously dramatic games against Liverpool in 2008 and 2009. The day began in Chippenham. I came in to work a little early and aimed to leave at 4pm. During the afternoon, I needed to be distracted from thoughts about the evening’s game. I emailed a few friends and we chatted about a whole host of subjects – specifically “unChelsea” – in an attempt to stop my wandering mind focus on the game. It has to be said, I was not confident about us being able to turn around the 3-1 deficit from that underwhelming first leg in the crumbling bowl of Stadio San Paolo. I mentioned to a few work colleagues, that if I was a gambling man, my money would be on the visitors. I collected Lard Porky from The Pheasant car park at just before 4pm. He had already had a few pints on a little pub crawl of his own and was his usual ebullient self. I made superb time on the M4 – probably the best yet – but the traffic drew to almost a standstill around three miles from Chelsea, just as we hit the Hogarth roundabout by Fuller’s Brewery. The Hammersmith flyover is still down to one lane and the last three miles took me an hour. It was a frustrating time as I knew that my mates would already be quaffing a few liveners in the pub. The minutes ticked by and the car was going at a snail’s pace. Funny the things you notice in a stationary car in a street that is usually seen at 40 miles per hour. A pub in a side street – The Black Lion – which appeared to back onto the River Thames (“could go there after, for one, Parky?”), a blue plaque on a house denoting a former residence of black activist Marcus Garvey, the smug face of Jose Mourinho on an advertisement on a London cab. I pulled into the North End Road at around 6.30pm just as a gaggle of around twenty Napoli fans were being lead away from the direction of the stadium by around ten policemen in high-vis jackets. Although they wore no team colours, they were obviously Italians, with baseball caps, shiny puffa jackets, scarves pulled high around their chins. Parky said that he saw one with a much bloodied nose. We parked up, and then walked past around eight further policemen on the crossroads of Lillie Road and the North End Road. There were no sirens wailing, yet, but I suspected that the streets would be busy with activity before the night fell. We reached the bar at about 6.45pm and the place was surprisingly quiet. Out in the beer garden, conversations were taking place all over and I rued the fact that Lord Porky and I had arrived late, almost three hours of travelling already behind us. Apparently, a mob of Napoli fans had tried to enter The Goose, but were seen off by a few Chelsea. It seems that Lord Porky and I had just missed the fun. There was talk of a confrontation down by West Brompton tube too. My mate Alan, who has been out of work for a while, pulled me to one side and told me that he had learned that morning that he has got a job at his old employers, at the Department of Trade & Industry in Victoria, and this was the best news all season. Fantastic stuff. It was a pleasure to meet up with Jesus once again (since the Stoke game, he had been to Venice and Rome…my goodness, this boy is living the life) and then, over in the corner, was Napoli Frank, who was with Mike and Chopper from New York. Frank is from Queens and I christened him “Napoli Frank” when I first met him in NYC in 2008 when I met up with the NY Blues for a Mets game (which was rained-off, but that’s another story.) Frank’s team is Chelsea – has been for years – but has family from the Naples area. He travelled out to Italy three weeks ago and had a seat in the home areas at the San Paolo. He carefully explained to me how he came in for major grief when a Napoli fan spotted his Frank Lampard wrist-band. Thankfully, his uncle was able to say “he’s with me.” Lard Porky and I only had time for a single beer. I got the impression that a lot of my mates had been in the pub for quite a while. The perils of being a long-distance Chelsea fan hit home again. I made haste and left the boozer at 7.10pm. I overheard many Italian accents. This was turning into just the sort of night I had expected. Lots of noise, tons of atmosphere and a little menace thrown in for good measure. As I passed The Slug And Lettuce, more puffa jackets, more Neapolitan swagger. A line of around twenty police dogs were facing the tube station in front of the town hall. This was indeed a rare sight. My pace quickened as I turned and bought a programme on the West Stand forecourt. Yet more Italian accents. I smuggled my camera in to the ground, despite the painful attention of a steward. I was inside at about 7.30pm. Despite the hundreds of Napoli fans outside the stadium, I was pretty amazed that the away section was full to bursting. With that, I received a couple of texts which said that there were, indeed, many ticket-less away fans outside the stadium and in various pubs. I quickly scanned the balcony for Napoli flags and saw many small ones, rather than a couple of large ones. I spotted a Confederate flag; a common sight in many football stadia throughout Europe, along with the skull and crossbones, the mod symbol, the flag of St. George and the celtic cross. Napoli fans as rebels, the underclass, the outsiders, the vagabonds? I can see that. That makes sense. The new banner – “Chelsea FC – London Is Ours” – had been moved from the NE corner to The Shed and had essentially swapped positions with the “Born Is The King” banner. I was well aware that this game was live on national TV in the UK. We needed to make a big impression in the minds of the viewing nation. This was almost as important as the team’s performance in my mind. I wanted us to create an old-style Chelsea atmosphere. I wanted people talking about us. The playing of “Blue Is The Colour” signaled the mass-waving of thousands of blue and white chequered flags. I’m in too minds about this. Half of me thinks that it is cheesy and naff. Half of me thinks that it adds great colour to the match day experience. The problem I have is that the flags are imposed upon us by the club. I’d much rather we were given free reign to bring our own adornments. I didn’t wave mine; I was too busy filming. The Mantle twins let loose the massive flag in the upper tier. It floated over the smaller flags and it was a pretty impressive sight. The teams strode past the large Champions League flag which was being waved on the centre-circle. Napoli were wearing a mucky grey kit. Our kit looked pristine in comparison. At the playing of the anthem, a hundred or so Napoli fans held their phones aloft, with the light mode on. Ah, that must be their “thing.” Worryingly, I saw a few lights in the home sections of The Shed and the West Stand, too. Maybe the Napoli fans had staged a massive undercover operation and were hiding in every section of The Bridge. Roberto chose his team and there were no complaints from me. In the Napoli team, all eyes were on the Three Tenors; Cavani, Lavezzi and Hamsik. At the kick-off, I was still not buoyed with any new-found confidence, though. In the back of my mind, I had the notion that a single goal mid-way through both halves would it be just fine. Nothing rushed, nothing manic. Just a night of calm pressure. Well, I could not have been more wrong. The game was a classic. The advantage lurched from one team to another, leaving me ecstatic, worried and breathless in equal measure. At the kick-off, the home support was roaring but Napoli enjoyed the better of the first quarter. By the fifteenth minute, first Hamsik, then Cavani, then Lavezzi made breathtaking raids on our goal, but a mixture of bad finishing and instinctive saves from Petr Cech ensured we did not concede. In retrospect, the opening twenty minutes resembled the Manchester City game before Christmas when we were completely out-passed and out-classed. Our midfield was giving the Napoli team far too much room to move the ball at their will. Upfront, chances were rare. Drogba was not firing on all cylinders. I was deeply worried. However, our fortunes were soon to change in a most dramatic piece of play. Didier’s flying header from a Ramires cross was as magnificent as it was unexpected. The ball flew into the Shed End goal and The Bridge erupted. I jumped to my feet and went dizzy for a few seconds. All around me, euphoria. There was that goal mid-way through the first-half I had dreamt of. Our play improved and shots from Essien and Luiz started troubling the Napoli ‘keeper. At the break, I rued how we had ridden our luck, but had shown a growing degree of resilience to withstand the attacks against us. Dennis Wise and his (now) 12 year old son Henry appeared on the pitch with Neil Barnett. Ah, memories of the last F.A. Cup Final at the grand old Wembley. The Simple Minds’ anthem “Alive And Kicking” boomed out on the PA; very apt. Soon into the second-half, a corner on the far side and Big John chose this moment to bang the balcony hoarding with his hand; a familiar part of the Stamford Bridge routine over the past few seasons. 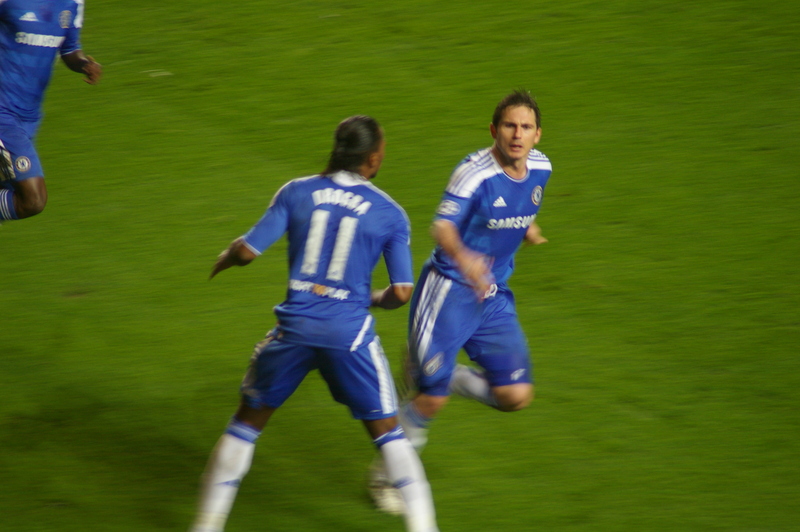 Frank lofted the ball in, slightly over the head of Didier, but – as I snapped with my camera – John Terry leapt. I just saw the ball fly into the top corner of the net and that was it; The Bridge erupted again as the captain ran over to that far corner, where Frank was still stationed. Advantage Chelsea. If no more goals ensued, we would progress. Lo and behold, a ball wasn’t cleared and I watched on, aghast, as a sweet strike from Inler flew into the bottom corner of Cech’s goal. In my seat in the MHU, I was right in line with its path. Oh, that hurt. This was now a pulsating game of football and was now in Napoli’s favour. Did anyone really think we would keep a clean sheet? Fernando Torres substituted the increasingly disappointing Daniel Sturridge. His fresh impetus inspired us. We now enjoyed a fine period of play. A fine Drogba swivel and shot flashed past the post. At the other end, Napoli attacked, but our defenders often stuck out legs to block goal ward shots. It was a superb game. What relief when, after a massive shout for handball, the referee quickly pointed to the spot, touching his arm at the same time. After all of those infamous penalty appeals against Barcelona in 2009, what joy to receive a penalty in our favour. The sense of anticipation was amazing. The chap in front of me turned away and couldn’t bare the tension. I held my camera up and waited for Frank to strike. The net billowed and Frank reeled away down to “his corner” and I clicked again. A point skywards to the heavens but his face showed a business-like resilience. He wasted no time in waiting for adulation, but simply raced back to the half-way line for the re-start. It was now level again. Let’s see how Napoli reacts again. To be honest, the rest of the game is a blur. Ninety minutes of play ended and we took a momentary pause. The PA system at The Bridge jumped to life in the brief period of rest until the extra-time period began. First, “Three Little Birds” and then “Blue Is The Colour” and there were hundreds of Chelsea fans joining in. I couldn’t immediately get back “into” the game as it restarted. I had felt that I had already experienced too much emotion for one night, thank you very much. Play was nervy and cagey. I struggled to get “up” for the game again. My mind wasn’t working. It was a strange feeling. An advance from Drogba on the right and he sent a low ball towards the penalty spot. Brana slammed the ball high into the Napoli net and The Bridge exploded once again. Despite my emotions running wild, I caught the sliding Brana and the immediate celebrations on film; I never know how I manage to do that. We held firm. Luiz was superb, Torres too. The midfield grew stronger as the game progressed. Even the addition of the two lesser lights Malouda and Bosingwa didn’t work against us. Chances came and went at both ends; a few half-chances for the industrious Torres would have sealed the night for us all. With two minutes of extra time to play, I had awful recollections of Iniesta in 2009. A similar denouement in this game would have been too much for any of us to cope with. It was nerve-tingling stuff. Every thwarted attack was met with pained exultations of joy. I lost count of the number of times I held my head in my hands. The texts started arriving and continued in to the night. The Chelsea family was together, as one. Alan, Gary and I were some of the last to leave the Matthew Harding. Gary showed typical kleptomaniac form and gathered together around ten flags from the seats around us; I said to Alan that Gary would be making leisure shirts out of them for the next game. Outside, yet more Italian voices. The place was swarming with Napoli fans; not sure if they were London-based Neapolitans, or whether a substantial volume had travelled from Naples minus tickets, intent on getting tickets from touts or maybe more mischievous means. I wondered if the girl we met on the train from Naples to Rome had made it. Many fans began chanting various Chelsea songs as we slowly walked down past the tube station. A little group of puffa jacket wearers were being interviewed by a TV crew. There was a mood of ecstatic bewilderment along the North End Road. I was slightly numbed by the evening’s football. My previous experiences of life as a Chelsea fan had prepared me for this to be a night of great calamity and disappointment. The fact that we had overturned a 3-1 reverse had totally surprised me. I met up with Parky at 10.45pm and we soon realised that we just had enough time to call into the “Black Lion” for a drink before I battled fatigue and the fog on my weary way back to deepest Wessex. Porky was in fine form and so was I; it was a fun trip back, full of nonsense and stupid jokes. I eventually reached home at 1.45am. It’s difficult to piece together how we managed to prevail against a clearly skillful and talented Napoli team. The old guard was certainly at the core of our triumph. We rolled back the years against Napoli and the night had me blinking my eyes at the stellar performances from Didier, Frank, JT, Ess and Ashley. I’m wise enough to know that this core may not be able to raise their games in similar fashion during the rest of this year’s competition. To advance further will be very difficult. To win it, will be a miracle. If nothing else, I’m a realist. However, as soon as United and City fell by the wayside this year – and then Arsenal joined them – I really wanted Chelsea to be the last man standing from these shores in the Champions League this season. On a superb night of football, we achieved that goal. This entry was posted in Season 2011-2012. and tagged 2011-2012, Branislav Ivanovic, Champions League, Dennis Wise, Napoli, New York Blues, Ultras by Chris Axon. Bookmark the permalink.